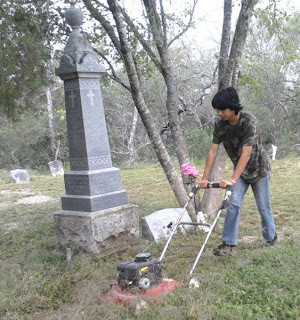 VON OMRY—The Ruiz Herrera Cemetery Association will hold its annual blessing and reunion on Saturday October 27, 2012 on the cemetery grounds at 10 AM. The annual gathering is a Von Ormy tradition that draws nearly 250 people to what can be described as part prayer service and part local history conference. After a traditional blessing, attendees display tables of family photos, genealogy charts and local history that dates back to the 1700s. The cemetery is located at the end of Ruiz Herrera Lane off of Quesenberry Road at what was the original settlement site of Von Ormy. The Ruiz family began ranching in the area in the mid-1700s and established a permanent settlement on the Medina in the mid 1820’s. The Ruiz Herrera Cemetery is notable for being the final resting place of two heroes of the Alamo, Francisco A. Ruiz, the mayor of San Antonio who buried the fallen after the battle and Blas Herrera, a scout who warned the defenders of Santa Anna’s approach. This year’s event will include a presentation on the early life of Jose Francisco Ruiz.